Wielding an MP3 player and ignition button banded together by tape and rubber bands in one hand and a plastic container connected to a stick in the other — and wearing red ear muffs to protect himself from a sound that could cause ear damage if heard for extended periods — David Knierim triggers a lightning strike inside his garage in Wilsonville. Immediately, an electric spark convulses, twitches, changes forms and elicits a raucous noise similar to a distorted guitar rendition of the "Twilight Zone" theme song. Then, suddenly, it dissipates and the apparatus rests. Knierim's lightning simulator — which spans nearly the length of the garage — includes a connected string of devices that produce 480,000 volts of electricity and 100 electric sparks per second. Knierim will display the simulator at the Portland Mini Makers Faire, which is a showcase of do-it-yourself technology, from 9:30 a.m. to 5:30 p.m. Sept. 15-16 in OMSI. Knierem is an engineer for Xerox and has lived in Wilsonville for nearly his entire adult life. He displayed the simulator in 2017 but the simulator is 20 percent more powerful this year. "It's fun and fascinating and they (attendees) might learn something," he says. While growing up in Sacramento and later hearing sudden bolts descend near his campsite while backpacking, Knierim has always been riveted by lightning. "My brother and I loved watching lightning storms," he says. "My sister would be afraid and go inside. We would sometimes push her to go out and watch some of it." Knierim thought of the idea of using a Marx generator, which is an electrical circuit that produces a high voltage pulse from a low voltage direct current, while researching a project using a Tesla coil, which produces alternating electric currents. Whereas Knierim's Marx generator is small, much larger Marx generators are used to test airplanes to see if they can brave lightning strikes. "I said 'Oh I hadn't heard about that. That looks fascinating. 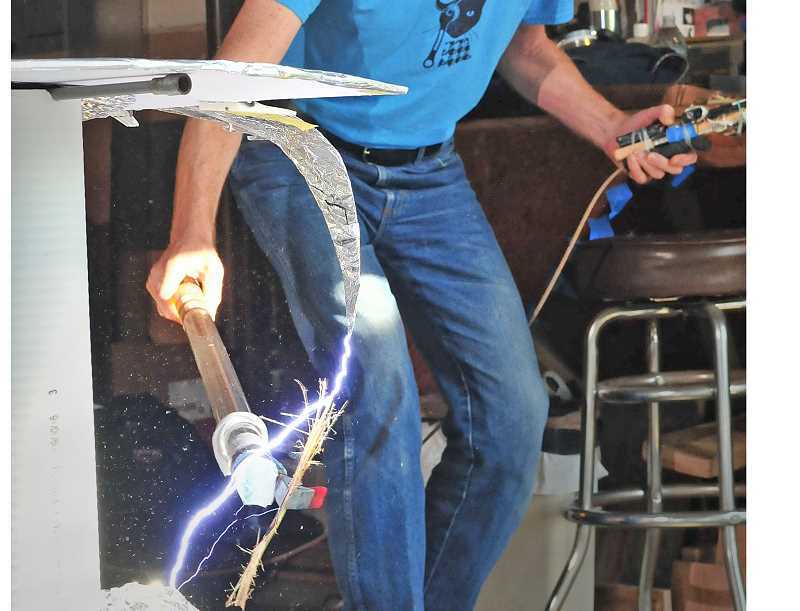 That looks like a simple way to make a high voltage toy,'" he says. "It was way harder than I thought." During a real lightning strike, the energy produced from the water droplets that form clouds sometimes creates an electric bolt when the clouds creep too close to each other or to the ground. Knierim tried to simulate this process. "The charges accumulate and get attracted to the ground at the edge of the cloud," he says. "That's enough voltage to break down the air and make a spark." As opposed to a basic Marx generator that can produce one spark and then must recharge, Knierim's lightning simulator produces 120 sparks per second. To do this, he used two 50-pound transformers, an inverter (which is used to charge a cell phone), 12 stacked capacitors armed with 40,000 volts and diodes to make sure the electricity flows in one direction rather than back and forth, and inductors, which store energy when electricity flows through it and isolates the capacitors from the strikes. Lastly, the electricity flows through a tube and into a giant air capacitor, which is where Knierim lights the spark. Knierim nixed several iterations and spent thousand of hours building the simulator. Oftentimes, the inductors would burn out. "The Marx generator makes a sudden high voltage pulse so it goes from zero volts at the top to a half a million in about a millionth of a second. It's very fast and that very fast rise wasn't distributed evenly from top to bottom," he says. "You'd get more voltage in some parts and less voltage in other parts so the parts with higher voltage would burn out." To solve the problem, he soldered together 3,000 mini-inductors. "I decided the way to divide (the energy) more evenly was to fuse many, many tiny inductors in a series so that would distribute it more evenly than bigger ones," Knierim says. "It took way more time than it was worth but I learned a lot in the process." For fun, Knierim also processed songs from an MP3 player into pulses using C programming language software so that the lightning can play tunes when ignited. "Last year I titled it as a musical Marx generator but no one knew what a Marx generator was so I didn't get as many people showing up," Knierim says. "This time I titled it lightning simulator so people could understand it a little better." Years ago, Knierim and his son built a ping pong ball launcher and presented it at the Maker Faire. Later on, the device broke the world record for the fastest traveling ping pong ball. The 2018 edition of the Guinness Book of World Records includes a blurb about their feat. "Mythbusters had sent it in to Guinness. Originally we weren't going to try to break the record," Knierim says. "We were just going to make one to take to the Maker Faire. We eventually got quite a bit faster than the Mythbusters one." Knierim also teaches science to foster children once a month throughout the school year. Ultimately, Knierim wants to show people that science shouldn't be stigmatized or intimidating and is, simply, fun. "I just like to get people excited about physical science and interested in it. It's exciting for me and a lot of people associate it with those geeks out there. I just want people to associate science with fun so it doesn't have that stigma," he says. "Yeah I'd love it if they picked up some things about the structure the electricity is going through. If they pick up some stuff like that that's great but I really want people to see that science can be fun, exciting and interesting."